The bodies were found in the bed of a pickup truck in the city, according to police. 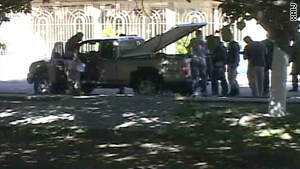 (CNN) -- The bodies of four men kidnapped from a wedding in Ciudad Juarez, Mexico, have been found in the bed of a pickup truck in the city, municipal police said Tuesday. The men, kidnapped Friday, included the groom, Rafael Morales; his brother, Jaime Morales; and their uncle, Guadalupe Morales, municipal police spokesman Jacinto Seguro said. The fourth person's name has not been released. All the bodies showed signs of torture, Seguro said. The bodies were found Monday afternoon and were identified on Tuesday, he said. "It's very sad, but, well ... that seems to be the situation," he added. The FBI has information that Rafael Morales was a U.S. citizen from La Mesa, New Mexico, and others may be as well, said Special Agent Andrea Simmons of the El Paso, Texas, FBI office. The FBI offered assistance this weekend to local and federal police in Mexico, Simmons said, but neither has requested anything so far. The men were kidnapped after gunmen stormed into the church in the middle of the wedding ceremony on Friday, Chihuahua State Attorney General's Office spokesman Carlos Gonzalez said Saturday. A fifth man was fatally shot in the incident, Gonzalez said. "It's unclear if this was gang- or drug-related," he said. Ciudad Juarez, Chihuahua, is the most violent city in Mexico, with more than 2,600 drug-related deaths in 2009. At least 870 people have been killed in the city this year, according to local reports. According to a report released in April by the Mexican government, Chihuahua is the Mexican state hardest hit by drug violence, with 6,757 people killed since the end of 2006.